I cook many kinds of meat, in many ways. 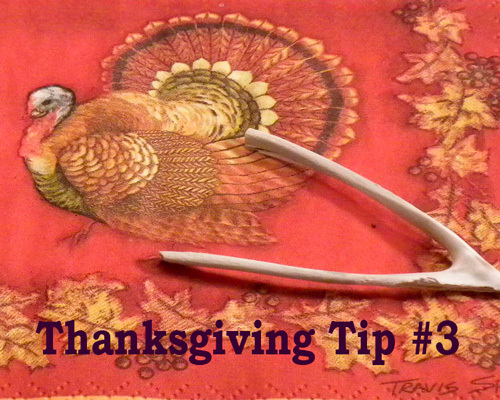 Often there are leftovers, which I would dutifully place in the appropriate containers and put in the refrigerator. I would look at them in the refrigerator, from time to time, and decide there was not enough left to make a meal. Then, after enough time expired, I would throw them out. At least that used to be my pattern. Now I use them to make delicious meals. As usual, the inspiration came from our ancestors. They would often combine different kinds of meat in the same dish, often with many different vegetables. It occurred to me that this could solve my problem of not having enough left over of a particular meat to make a meal. So I started combining them into stews and curries. If I have small amounts of leftover beef, chicken, lamb, pork, or other meat, I will combine them. Since the meat has already been cooked, there is no need for marinating or browning, and the stews and curries cook very quickly. 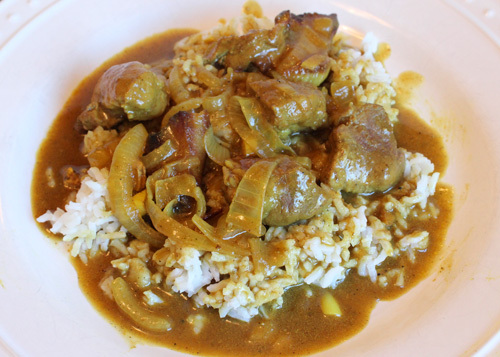 The curries are quicker to cook than the stews, so I make them more often. Heat the fat in a heavy frying pan, preferably cast iron, over medium heat, until the fat bubbles. Add the onions, garlic, and ginger, and cook for 2 minutes, stirring occasionally. Add the curry powder and the flour, and mix with the vegetables in the pan. Add the broth and fish sauce, and stir until the mixture thickens, and starts to simmer. Add the meat and mix well. Bring the mixture back to a simmer, then reduce the heat to low, and cover the pan. Simmer covered for 25 minutes. Serve with the organic rice of your choice. Most Americans think of corned beef and cabbage when it comes to a traditional Irish meal on St. Patrick’s Day. In Ireland itself, the selection is much more varied, including steak, prime rib roast, stew, or a pot roast made from fresh meat. One of the glories of Irish cuisine is the magnificent quality of the native ingredients. Most of the beef raised in Ireland is still grassfed and grass-finished, and raised on small farms. This recipe depends on the quality of the ingredients, and the better the ingredients, the better the dish. 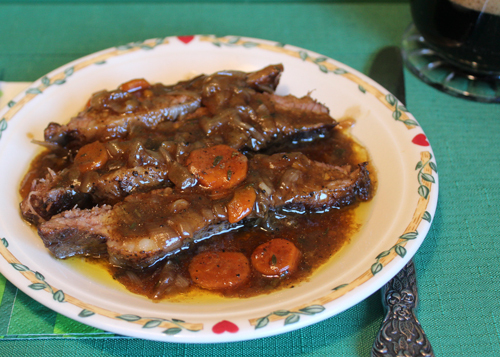 The new beef brisket point introduced by U.S. Wellness Meats is perfect for this recipe. 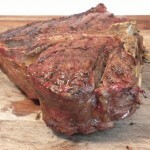 It has the deep beefy flavor of grassfed beef, and a nice fat cap that is needed for this recipe. It is important that all the other ingredients be of high quality as well, meaning organic (or the equivalent) vegetables and herbs, Guinness® stout from Ireland itself, and rich, deeply flavored grassfed beef broth. And it does have a bit of green in it, in the form of green onions and thyme. Thai coffee, creamy and sweet with organic cream. 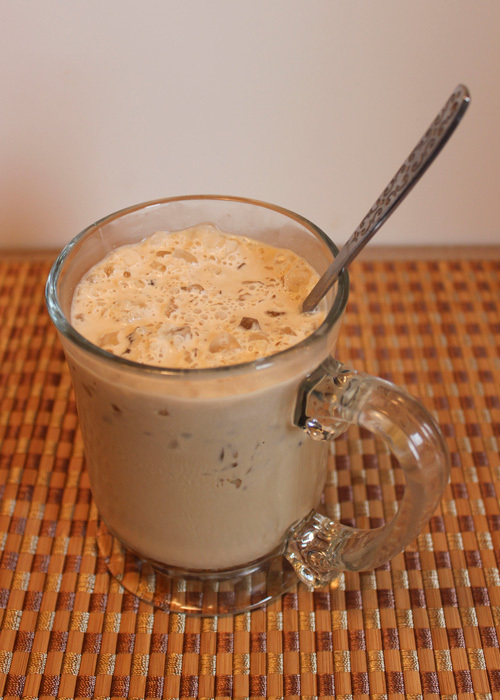 Some years ago, my wife and I had a favorite Thai Restaurant, and we really enjoyed their Thai coffee, a very cold, sweet, and flavorful drink, very refreshing and tasty. Nothing like it on a hot day. The restaurant closed, we discovered real food, and we just stopped having Thai coffee. A couple of Thai restaurants opened in our area, and we remembered how much we liked the previous one, so we decided to try them out. We were delighted to see that the first restaurant had Thai coffee. But being committed to real food, we had to ask if it had sugar or any other sweetener. “Lots of sugar,” said the waitress. We had given up eating refined sugar a long time ago, so this coffee was out. The second restaurant also had Thai coffee on the menu. When we asked about sweeteners, once again we heard that there was lots of sugar. We wanted Thai coffee! But not the sugar. So I checked out my library of cookbooks, and found three books on Thai cooking. Two of them had recipes for Thai coffee. Interestingly enough, neither recipe added sugar, but both depended heavily on canned evaporated milk. No way to know where the milk came from, or what the cows were fed or given, or what cooking and canning milk would do to its nutritional qualities. But we still wanted Thai coffee! So what could we do? Invent our own version, of course. We decided to leave out all sweeteners and substitute cream, real, heavy cream from a good organic dairy for the evaporated milk. The recipe was very simple, and very delicious. It did not taste like our memory of Thai coffee, not exactly, but it was very good, creamy, cold, and just delicious. And very refreshing. The recipe is simplicity itself. Chill a pint of strong coffee in the refrigerator. For each serving, fill a tall glass about seven-eighths full of shaved ice, (or ice crushed in a blender), preferably made from filtered water. Add enough coffee to the ice until the glass is three-quarters full of coffee. Add enough fresh, rich, heavy, organic cream to fill up the glass. Mix well with a spoon. 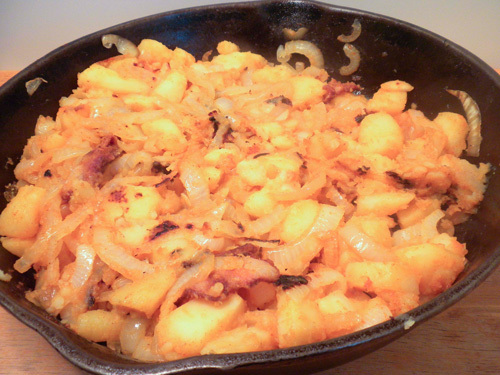 This delicious potato dish will be enjoyed by most, but not by people who are allergic to nightshades. When it comes to nutritional advice, we are treated as if we are all the same person, with the exact same nutritional needs. Doctors and nutritionists give the same recommendations for what everyone should eat at a certain age. Individual nutritional needs of the person are ignored, and never considered. The standard is the same for everyone of a certain age group. Yet the truth of the matter is that each of us is a unique individual, of different sizes, body composition, body chemistry, genes, and many other factors that make each of us unique. The “one size fits all” approach taken by the medical profession and conventional nutritionists does not really fit anyone. Hippocrates of Kos, the most famous doctor of ancient times, lived well over two thousand years ago. Yet his approach to treating his patients was totally different from the one-size-fits-all approach, and makes a lot more sense. Hippocrates treated each of his patients as a unique individual, getting to know them. His treatment of choice was diet, which mainly consisted of finding out what foods the patient needed, and providing them. He paid careful attention to how the individual patient responded to the foods he prescribed, and if the desired results were not obtained, he tried something else, either other foods, or rest, or a particular exercise, or any combination of the above. Drugs and surgery were used only as a last resort. Hippocrates was famous for healing most of his patients, and even stopped a plague that was devastating Athens. The same principle applies to nutrition and natural remedies. What works for one person may not work for another, or may even harm them. In fact, since our nutritional needs often change, what worked at one time may not help another time. The very same food or herbal remedy that heals one person may be useless for another person. This is because our nutritional needs, while very similar to those of other people, are never identical, and often change. For example, some people are allergic to members of the nightshade family of plants, such as potatoes, and other people thrive on them. So How Do We Know What to Eat? Nature has given us the senses we need to determine this. Our senses of taste, smell, sight, and our intuition can tell us what is good for us to eat at a particular time. The healthy peoples studied by Dr. Weston A. Price understood this principle, and had developed a traditional cuisine over the centuries that kept them so healthy that they had no disease, and no need for medical care. Being of a similar heritage and ancestry, the foods that their ancestors ate helped them thrive. Yet even among these so-called primitives, individuals would vary their diet depending on the needs of the moment. They might stop eating a particular food that did not appeal to them at the time, or seek out a particular food that they craved. These patterns were noticed and remembered by these peoples, who would make special foods available to individuals at a certain time, such as recovering from a physical injury, or being pregnant, or wanting to conceive, or many other circumstances. This is much harder to do in modern society, where food has been industrialized and changed by chemical processing and the use of flavor enhancers. Our senses often cannot tell what industrial foods are good or bad for us, or how much to eat, or how to get particular nutrients. The solution I have found for myself, is simple. Just eat real food, as said by Sean Croxton. Our bodies know how to sense and deal with the foods of nature. 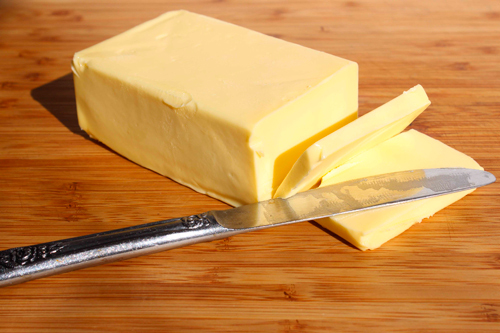 Pay attention to how a food smells, tastes, and to your cravings for a particular real food. I find that following my senses and cravings is the best way I have found to know what to eat, and how much. This only works with real food. The better a particular real food tastes, the better I feel it is for me to eat it at that particular time. And if a food does not appeal to me, or tastes bad, I stop eating it. Often a food that tasted wonderful at the beginning of a meal will not taste as good after I have eaten some of it. This is my body telling me that I have had enough. Our bodies know what we need and how to get it from real food. 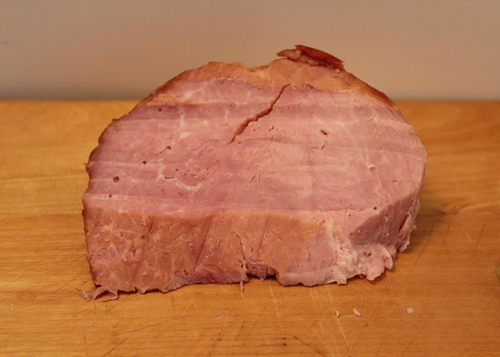 Notice the smoke ring around the edges of the heritage ham, after I marinated it and smoked it with pork fat. The marketing was effective, I must admit. It even convinced me. A large boneless ham, raised on a small farm, from a heritage breed, cured in a traditional manner, smoked over hickory wood. And at a bargain price! The ham was fully cooked, which meant I could reheat it slowly in a low oven. Easy. When the ham arrived, and was thawed, I started to take off the reddish brown wrap. As I started to remove it, I realized that the wrap was clear. The ham itself was covered with a dried coating, reddish brown in color, which had the consistency of sawdust glued together. Netting lines were deeply sunk all over the ham, from the netting that was used when it was hung to smoke. 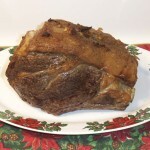 I began to realize that the coating around the ham was the ham itself, what the outside of the roast had turned into, with not a single shred of fat in evidence. In mounting horror, I came to realize that all fat had been trimmed off the ham before smoking. With no fat to keep it moist, the ham had dried out in the smoking process, and lost most of its moisture. I stuck a fork in the ham, it met a lot of resistance. The meat was tough. I sliced off a small outside piece of the ham and tasted it. The outside meat tasted terrible, with a horrid texture of sawdust. The interior meat was dry, so dry. Hardly any smoke flavor. Chewy, not tender at all. Not good. But there was a hint of a good pork flavor in there. My family was expecting a nice meal. I decided to save the ham. A plan was needed. I decided to cover the ham in organic apple juice, and marinate it for a few hours. This should add moisture and flavor. Then, I would add fat and heat it slowly in front of a smoky barbecue fire, at very low heat. This would add the smoke flavor it should have had. And I would restore the fat to the meat, by putting some sliced pork fat from another roast over the top of the ham. I did not know if this would work, but I was going to give it my best. But first, that sawdust-like outer coating had to be trimmed off and discarded. I took a sharp knife and trimmed the whole thing, getting off every scrap of the outside. I placed the ham in a glass bowl, poured the apple juice over it, and set it to marinate. A couple of hours later, I stated a barbecue fire, using some hickory. I brought the temperature up to about 225 degrees. I placed the ham on a rack in a pan, covered the top with sliced pork fat, and set it to smoke. Several hours later, I boiled down the apple juice used for the marinade, until three-quarters of the liquid was gone, and used it to baste the ham occasionally. I was encouraged when I stuck a fork into the meat—it felt much more tender than before. I continued cooking until the roast had been reheated. Then I started slicing it in the dining room. The knife glided easily through the tender meat. There was a wonderful wood smoke smell. The ham was moist, tender, and so delicious that it was hard to stop eating it. A disaster had become a wonderful meal. The inherent wonderful flavor of the heritage pork had been unlocked deliciously, once fat and moisture had been restored.